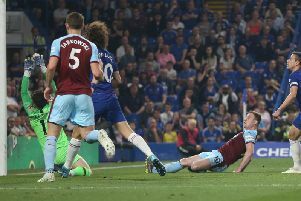 James Tarkowski has said that there is no need for panic stations just yet but the Clarets defender accepts that something needs to change. Sean Dyche’s side have yet to win over 90 minutes in eight competitive fixtures this term, having overcome both Aberdeen and Istanbul Basaksehir in extra-time, but that record can’t continue if the club has ambitions of reaching the Europa League group stages. Only victory will do for Burnley on Thursday if they’re to stand any chance of joining the likes of Chelsea, Arsenal, Bayer Leverkusen, Lazio and Milan in the next stage having lost 3-1 against Olympiakos in the Greek capital. After finishing seventh in the Premier League last season, the England international knows that they can draw on that quality to prevail. “The group’s not changed much, there have been one or two additions but it’s more or less the same lads who are still here now,” he said. “It’s only us who can change it, which we’ll be working hard to do. “There’s only us who can really change it so we’ve got to concentrate on getting things right and working at it. Tarkowski adeded: “It’s very early season but we need to sort it out. We don’t want to continue this form where we’re conceding a lot of goals. We need to get back to what we do well and hopefully on Thursday we can show that. “It was an interesting atmosphere out there, very loud, very hostile and hopefully our fans can bring a little bit of that. “We need to be positive because we need to score two goals so we can just go for it and see how it goes.